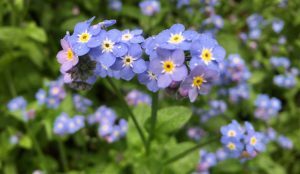 As I wandered the Island roads today, wild Forget-Me-Nots lined my path, bringing a delightful and immediate heart-connection with the Anguane, the magical women of the waters in the Italian Alps. With the appearance of “their” flower, the Anguane seemed to be asking me to remember them, as they do in the folk stories of Trentino, Italy. In one of the stories, “The Anguane of Cismón,” three young women came to the Primiero Valley every summer to sell bouquets of blue flowers that no one had ever seen. The girls were mysterious, shy and beautiful. According to the villagers, they lived in the river and were probably Anguane. A young shepherd named Sirór became enamored with one of the three young woman – the one with the golden hair. One day Sirór followed them to the river, where he saw them dive into the water and turn into otters. Sirór was so stunned that he fainted. When the Anguane emerged, they turned into young women again. But now, with their secret discovered, they had to return to the waters forever to live like otters. Lamenting the discovery, the golden-haired Anguana kissed the sleeping shepherd good-bye before they swam away. The next morning, when Sirór awoke, wondering if it all had been a dream, he noticed that the field all around him was covered with the blue flowers that the Anguane had been selling. Feeling compelled to go down to the river, he saw only a ripple of golden color in the current of the waters, as he heard the words “non ti scordar di me” – don’t forget me! Listening to a treasured recording of this story in the Trentino dialect, there is a lyrical cadence. Even if I don’t understand every word, the message finds its way into places in my genetic memory, like poetry or a song. Or like a stream in nature that finds a submerged path to travel. The legendary origins of the Primiero Valley are attributed to a single Otter, who lived there when the entire area was covered by a lake. The Otter steadily dug between the hard rocks, creating a passageway for the water to enter and go downstream, thus allowing humans to live there. The stemma (coat of arms) of Imèr, a village at the entrance of the valley, bears an Otter as the central image. With this tribute, the villagers are expressing gratitude to Otter and remembering their links to the natural world. Foches, Andrea. 2007. Leggende delle Anguane [Legends of the Anguane]. Torino: Priuli & Verlucca (Editori and San Michele all’Adige: Museo degli Usi e Costumi della Gente Trentina). Neri, Mauro. 2010. The Secret Heart of Trentino: A Calendar of Legends. 4 vols: Spring, Summer, Autumn, Winter. Lavis, It. : Litotipografia Alcione. This entry was posted in Anguane, Folk Stories, Plants, Trentino by Mary Beth Moser. Bookmark the permalink. What a beautiful story. It is good to imagine our connections with nature, and you always help me do this, Beth. Thank you. We all need beauty in our very hurried lives. Yes indeed. . . thank YOU for reading this story and commenting! May Beauty always walk with you. Thank you for picking these beautiful flowers and linking them to this Anguane story. This is a gift to us all. I love this story and the women who shapeshift into otters. The image of the ripple of the golden color left in the stream is haunting and beautiful. I admire a culture that honors its connection to the mysteries of the animal and plant worlds. Thank you dear Lori! I appreciate your thoughtful comments. My Holy Word. Thank you.